Hibernian defender Claire Williamson says Glasgow City face their toughest fight yet for the Scottish Women's Premier League, which starts on Sunday. City begin a 10th straight title defence against Stirling University. However, Celtic have strengthened in pre-season, and, after winning both domestic cups last year, Williamson says Hibs want to complete the set. "It's definitely going to be the tightest season yet looking at the teams," Williamson told BBC Scotland. "Last year was just an amazing year, but I think you have to take all those experiences and use them to push on. We really want to improve our consistency. We want to challenge for the league. "We always have belief in ourselves. We know on our day we're one of the best teams. Everyone's a challenge. Celtic definitely have strengthened, the whole league is getting better, but that's only a good thing." Last season, Glasgow lost just one league game and finished eight points ahead of Hibs. City did not get things all their own way, though, with Hibs defeating City in the League Cup final in May and also November's Scottish Cup final. Williamson was coy about suggestions Hibs are favourites this time to finally knock City off their perch, with a difficult opening game against Rangers on Sunday. "We're hoping so, but we'll just take every game as it comes, build on what we achieved last year, and see what happens," she said. "Rangers are always a good side. They've got a lot of young, good players, who are always keen to prove themselves." Celtic, who visit Hamilton on Sunday, have been the dominant force in men's football and are eager to add the women's title to the trophy cabinet. They watched on last season as Glasgow and Hibs starred in the Champions League knock-out stages and will be spectators again this year having finished 13 points off the qualifying spots. Head coach David Haley is determined to bridge the gap and has signed Sarah Crilly from Glasgow rivals City and Sarah Ewens from Hibs, as well as defender Kelsey Hodges from the USA. 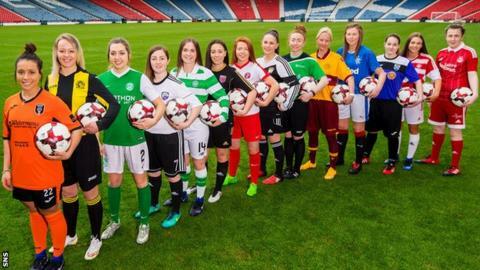 Striker Kirsty Howat believes Hibs are favourites for the title, but is hopeful her side can make it a three-way fight for the league to repay the backing of the club. "We've had a few new signings, positive signings though," said Howat. "I'd like to see us get second or push on for first. "Celtic don't want us to be just the women's team or the youth team, they want us to be one club. That's refreshing to hear and they've been promoting us really well and some Celtic fans are coming along to our games. "They've put a lot of money into us and hopefully we can give something back." Glasgow City will not give up their title without a fight and have looked across the Atlantic for new talent with USA youth striker Savannah Jordan and US-born Jamaica international Lauren Silver joining the club. Silver, who can operate in defence and midfield, arrives from French side Metz and says she is impressed with Glasgow City's style of football. "At Glasgow City we pass, we move, we have a lot of possession, we change the point of attack often so it's great to see these technical players," said the 23-year-old Florida native. "The play in France is a little more technical. I think with Glasgow City they mirror the US more in the way we keep the ball and try and break down teams." Aberdeen face Spartans in the weekend's other top-flight fixture.